At True North Gold Buyer Ltd., the silver, platinum & gold buyer of your choice, we offer you top prices for your old or unwanted Sovereign and Half-Sovereigns. Below you will find further information on coins we buy. If you cannot find your coin below or have a coin that you cannot identify please write us an email via our Contact Form or call us at (705) 302 1055 to obtain an estimate. Please keep in mind that we may not be able to provide you with an accurate estimate until we’ve seen the coin. We will gladly buy any other gold bullion coin you may wish to sell. A Gold Sovereign is a gold coin first issued in 1489 for Henry VII of England and still in production as of 2009. While the coin typically had a nominal value of one pound sterling or 20 shillings, the sovereign was primarily an official piece of bullion with no mark of value anywhere on the coin itself. The name “sovereign” comes from the majestic and impressive size and portraiture of the coin, the earliest of which showed the king facing, seated on a throne, while the reverse shows the Royal coat of arms on a shield surrounded by a Tudor double rose. Original sovereigns were 23 karat (95.83%) gold and weighed 240 grains or one-half of a troy ounce (15.6 grams). Henry VIII reduced the purity to 22 carats (91.67%), which eventually became and remains the gold coin standard (so-called crown gold) in both England and the U.S.; the weight of the sovereign was repeatedly lowered until when it was revived after the Great Recoinage law of 1816, the gold content was fixed at the present 113 grains (7.322 g), equivalent to 0.2354 Troy ounces. Sovereigns were discontinued after 1604, being replaced by Unites, and later by Laurels, and then guineas. Production of sovereigns restarted in 1817. The initial reverse type for gold coins was the shield and crown motif, supplemented on the sovereign with a heraldic wreath. This was succeeded in 1871 by a portrayal of Saint George killing a dragon, engraved by Benedetto Pistrucci. 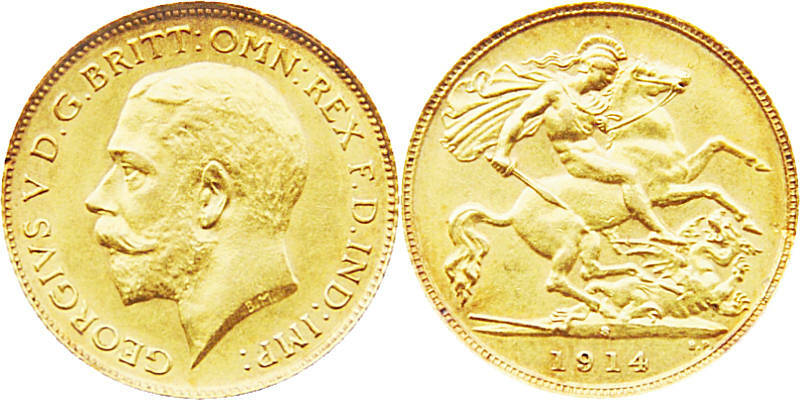 This same design is still in use on British gold sovereigns, although other reverse designs have also been used during the reigns of William IV, Victoria, George IV, and Elizabeth II. The half sovereign was first introduced in 1544 under Henry VIII. It was a gold coin valued at ten shillings or 120 pre-decimal pennies. After 1604, the issue of half sovereigns, along with sovereigns, was discontinued until 1817, following a major revision of British coinage. Production continued until 1926 and, apart from special issues for coronation years, was not restarted until 1980. It was also used extensively in Australia, until 1933. Modern half sovereigns, from 1817 onwards have a weight of 3.991 grams (diameter has beeen changed slightly and changed back again) are made of 22KT (91.666%) gold alloy. The reverse side, featuring St. George slaying a dragon was designed by Benedetto Pistrucci, whose initials appear to the right of the date. What a sincerely great experience. I’ll definitely do business with them again if I find anymore jewelry I want to sell. 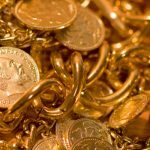 Beware of fake gold scams! True North Gold Buyer is the best place to sell your gold. We are a 100% Canadian owned and operated Company. We offer fast & easy cash for gold, silver and platinum in all of the following Canadian areas.